ilulz Blog: For Nikon lovers, check out this new camera! For those of you who love photography and basic point-and-shoot strategy, meet this small camera! This tiny Cooklpix S02 measures just 3.1 inches wide by 2.1 inches high by 0.7 inch thick and weighs only 3.6 ounces. With this body there is a 3x f3.3-5.9 30-90mm lens, a 2.7 inch 230K dot resolution touch screen, and a 13-megapixel CMOS sensor. Not to mention that the memory and battery are built in, which will not make the camera get any heavier. The battery can be charged via USB which can take up to 210 shots, and will definitely not fill up the 7.3 GB flash memory. The camera has CMOS sensor which allows you to record a video at a resolution up to 1080p at 30 frames per second. It also includes multi-shot modes for HDR backlight correction and hand-held night scenes. 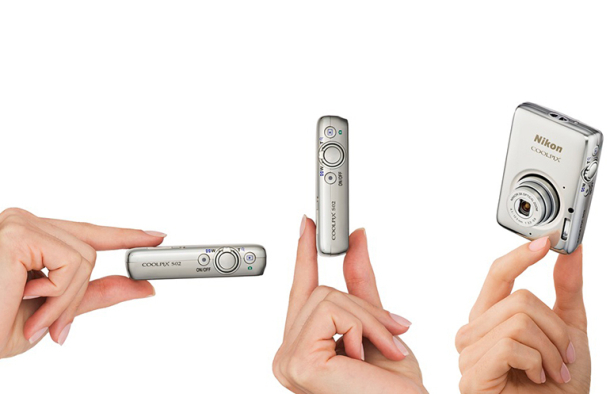 This tiny beautiful camera will be available in September for $179.95 with different colours; silver, white, pink or blue.